A who's who of science's next generation. Nearly impossible to put down: engaging original essays from brilliant young scientists on their work — and its fascinating social, ethical, and philosophical implications. A preview of the ideas you're going to be reading about in ten years. If these authors are the future of science, then the science of the future will be one exciting ride! Find out what the best minds of the new generation are thinking before the Nobel Committee does. A fascinating chronicle of the big, new ideas that are keeping young scientists up at night. Brockman has a nose for talent. Capaciously accessible, these writings project a curiosity to which followers of science news will gravitate. The engrossing essay collection which offers a youthful spin on some of the most pressing scientific issues of today—and tomorrow...Kinda scary? Yes! Super smart and interesting? Definitely. The perfect collection for people who like to stay up on recent scientific research but haven't the time or expertise to go to the original sources. To generate this list of contributors, I approached some of today’s leading scientists and asked them to name some of the rising stars in their respective disciplines: those who, in their research, are tackling some of science’s toughest questions and raising new ones. The list that resulted amounts to a representative who’s who of the coming generation of scientists. ONLINE Laurence C. Smith: "WILL WE DECAMP FOR THE NORTHERN RIM?" At stake is no less than the global pattern of human settlement in the twenty-first century. Christian Keysers: "MIRROR NEURONS: ARE WE ETHICAL BY NATURE"
Evolution has equipped our brains with circuits that enable us to experience what other individuals do and feel. Nick Bostrom: "HOW SHALL WE ENHANCE HUMAN BEINGS?" Sean Carroll : "OUR PLACE IN AN UNNATURAL UNIVERSE"
The early universe is hot and dense; the late universe is cold and dilute. Well...why is it like that? The truth is, we have no idea. Stephon H. S. Alexander: "JUST WHAT IS DARK ENERGY?" Dark energy, itself directly unobservable, is the most bewildering substance known, the only "stuff" that acts both on subatomic scales and across the largest distances in the cosmos. Sarah-Jayne Blakemore: "DEVELOPMENT OF THE SOCIAL BRAIN IN ADOLESCENCE"
Using modern brain-imaging techniques, scientists are discovering that the human brain does indeed change well beyond early childhood. Jason P. Mitchell: "WATCHING MINDS INTERACT"
Perhaps the least anticipated contribution of brain imaging to psychological science has been a sudden appreciation of the centrality of social thought to the human mental repertoire. Matthew D. Lieberman: "WHAT MAKES BIG IDEAS STICKY?" Big Ideas sometimes match the structure and function of the human brain such that the brain causes us to see the world in ways that make it virtually impossible not to believe them. Joshua D. Greene: "FRUIT FLIES OF THE MORAL MIND"
People often speak of a "moral faculty" or a "moral sense," suggesting that moral judgment is a unified phenomenon, but recent advances in the scientific study of moral judgment paint a very different picture. ONLINE Lera Boroditsky: "DO OUR LANGUAGES SHAPE THE WAY WE THINK?" 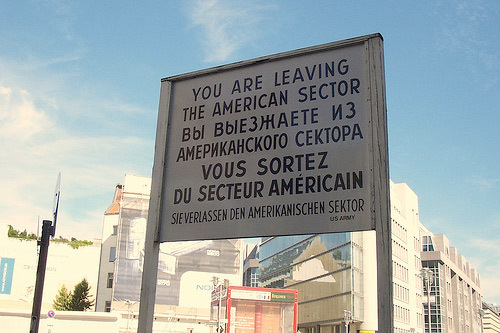 Language is a uniquely human gift, central to our experience of being human. Appreciating its role in constructing our mental lives brings us one step closer to understanding the very nature of humanity. Sam Cooke: "MEMORY ENHANCEMENT, MEMORY ERASURE: IS THIS THE FUTURE OF OUR PAST?" Once we come to understand how our memories are formed, stored, and recalled within the brain, we may be able to manipulate them—to shape our own stories. Our past—or at least our recollection of our past—may become a matter of choice. Deena Skolnick Weisberg: "THE VITAL IMPORTANCE OF IMAGINATION"
The main goal of my research is to discover the nature of the what-if mechanism and how it allows us to create and comprehend fictional worlds. 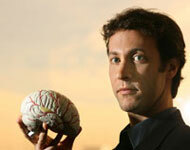 ONLINE David M. Eagleman: "BRAIN TIME"
The days of thinking of time as a river—evenly flowing, always advancing—are over. Time perception, just like vision, is a construction of the brain and is shockingly easy to manipulate experimentally. ONLINE Vanessa Woods & Brian Hare: "OUT OF OUR MINDS: HOW DID HUMANS COME DOWN FROM THE TREES AND WHY DID NO ONE FOLLOW?" Nathan Wolfe: "THE ALIENS AMONG US"
While viruses have to infect cellular forms of life in order to complete their life cycles, this does not mean that causing devastation is their destiny. The existing equilibrium of our planet is dependent on the actions of the viral world, and their elimination would have profound consequences. Seirian Sumner: "HOW DID THE SOCIAL INSECTS BECOME SOCIAL?" We would like to know what the conditions and selection pressures were that tipped the ancestors of the eusocial insects over the ledge and down toward eusociality. Katerina Harvati : "EXTINCTION AND THE EVOLUTION OF HUMANKIND"
It is now clear that humans (whether fossil or living) are not immune from biological forces and that extinction was (and, indeed, is) a distinct possibility. Gavin Schmidt: "WHY HASN'T SPECIALIZATION LED TO THE BALKANIZATION OF SCIENCE?" Even as scientific output has increased exponentially, concerns have been raised that growing specialization will end by making it impossible for scientists in different fields to communicate, let alone collaborate. FOR PROPHETIC visions of the future, some people turn to horoscopes or fortune tellers. But if you really want to know what the future holds, ask a scientist. Not just a renowned, seasoned scientist, but a fresh mind, someone who is asking themselves the questions that will define the next generation of scientific thought. That's precisely what Max Brockman has done in this captivating collection of essays, written by "rising stars in their respective disciplines: those who, in their research, are tackling some of science's toughest questions and raising new ones". The result is a medley of big ideas on topics ranging from cosmology and climate change, to morality and cognitive enhancement. The collection is diverse, but one theme resounds: when it comes to the human race, the whole is greater than the sum of its parts. We owe our evolutionary success to our unique modes of social behaviour. In their essay "Out of our minds", journalist Vanessa Woods and anthropologist Brian Hare suggest that it wasn't intelligence that led to social behaviour, but rather social behaviour that paved the way for the evolution of human intelligence. 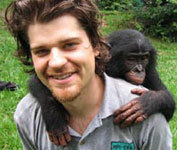 "Humans got their smarts only because we got friendlier first," they write. We are a social species, and we have our brains to thank. As Harvard University neuroscientist Jason Mitchell writes: "The most dramatic innovation introduced with the rollout of our species is not the prowess of individual minds, but the ability to harness that power across many individuals." People's exposure to the world of science is too often limited to watching the Discovery Channel or "reading" National Geographic. But the essence of science is not only what is happening today, but what could happen tomorrow. "What's Next? 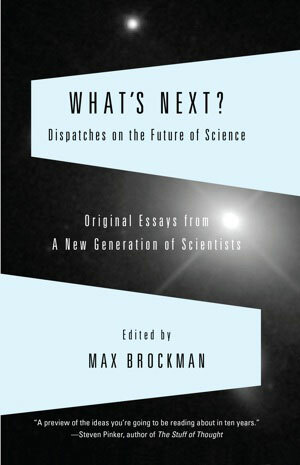 Dispatches on the Future of Science" is a book of science essays collected and edited by Max Brockman. It boasts that the authors of the 18 original essays that make up this book come from a "new generation of scientists" and are the future of science. ...In his preface, Mr. Brockman says of the scientists writing in this collection that "their ideas will eventually help to redefine who and what we are." It is a claim well supported by this engaging book. Perhaps the world started with a bang, but if the scientists who contributed to "What's Next?" have anything to do with it, it will certainly not end with a whimper. ...Brockman gives a sneak peek of the next generation of scientific discovery with a compilation of essays by 18 of today's most promising young scientists. Essays weigh in on some of the most perplexing questions in astrophysics, neuroscience, paleoanthropology, and a cross-section other research fields. The authors detail new revelations about childhood and adolescent brain development; reexaminations of the role of culture in the way individuals think; and critical speculation on the universe's mysterious stores of "dark energy" and "dark matter," among more subjects. Other essays speculate on future trends, such as the ethical frameworks that we might put in place to govern genetic engineering, and the prospect that climate change may spark massive migrations of human communities from warmer regions to the Northern Hemisphere. In all, authors challenge long-standing notions and elucidate intriguing new ones. ...I take the following from an essay titled "Brain Time" by Dr. David M. Eagleman which appears in a book called "What's Next? 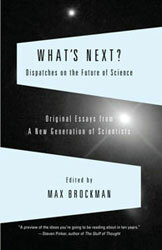 Dispatches on the Future of Science," edited by Max Brockman. Dr. Eagleman is a bright young scientist who has undergraduate degrees from Rice University and Oxford University in literature, but who obtained a doctorate in neuroscience from the Baylor College of Medicine 11 years ago. Today he is director of the Baylor College of Medicine's Laboratory for Perception and Action. The lab's long-term goal is to "understand the neural mechanisms of time perception," which in plain English is to figure out how our brains make us think time has slowed or sped up when it hasn't. It was his and his colleagues' work that allowed me to say that our intuitions are correct: people in traumatic situations do perceive time to slow, but a hair-raising experiment shows they have no extra time to react or do anything extra beyond what would normally be possible. Language may shape our thoughts. ...Language even shapes what we see. People have a better memory for colors if different shades have distinct names—not English's light blue and dark blue, for instance, but Russian's goluboy and sinly. Skeptics of the language-shapes-thought claim have argued that that's a trivial finding, showing only that people remember what they saw in both a visual form and a verbal one, but not proving that they actually see the hues differently. In an ingenious experiment, however, Boroditsky and colleagues showed volunteers three color swatches and asked them which of the bottom two was the same as the top one. Native Russian speakers were faster than English speakers when the colors had distinct names, suggesting that having a name for something allows you to perceive it more sharply. Similarly, Korean uses one word for "in" when one object is in another snugly (a letter in an envelope), and a different one when an object is in something loosely (an apple in a bowl). Sure enough, Korean adults are better than English speakers at distinguishing tight fit from loose fit. If your favorite day of the week is Tuesday, because that's when the Science section of The New York Times is published, and your favorite NPR show is Ira Flatow's Science Times, then you'll love What's Next? Dispatches on the Future of Science, a collection of essays written by young scientists about what they do and how they see the future of their fields. Even if you're not quite that much of a science geek, if you have an interest in the world around you and the process by which scientific research can both explain and mold that world, you'll enjoy this collection edited by Max Brockman. No expertise in any field is required to understand these essays; if you can follow Malcolm Gladwell, you'll have no troubles with What's Next? Brockman's essayists represent a variety of fields, from physics to paleoanthropology, with a heavy leaning toward the human sciences. This is a good choice from the marketing point of view, since non-scientists tend to be more interested in topics relating to human psychology than, say, the role played by dark energy in accelerating the expansion of the universe, but fans of hard science may feel slighted. That objection aside, this is the perfect collection for people who like to stay up on recent scientific research but haven't the time or expertise to go to the original sources (which, in the case of modern science, usually means articles published in professional journals, which are not generally available to those without access to an academic library). Each essay is self-contained, making it possible to choose those most relevant to your own interests. And it's a great airplane or beach book because you can read the essays in any order; each is brief enough to be read between the interruptions of gate announcements or children demanding attention. My personal favorite is "What Makes Big Ideas Sticky?" by UCLA psychologist Matthew Lieberman, which argues that ideas which mirror the structure and function of the human brain may seem so obviously true to us that they resist being discarded, even in the face of overwhelming amounts of scientific research demonstrating their lack of merit. The collection closes with an essay by NASA climatologist Gavin Schmidt entitled "Why hasn't specialization led to the Balkanization of science?" He argues that in contradiction to the stereotype of the scientist as someone who knows more and more about less and less, interdisciplinary research is central to modern science and describes both the factors which lead to greater isolation among fields of research, and those which encourage cooperation and sharing of ideas. Communication of major ideas in nontechnical language is one of the factors which encourages cooperation, and What's Next? represents an important contribution to that effort. Does language shape our thinking? She brings up experiments and other examples involving use of language and direction, time, color and gender, all of which seem to demonstrate that yes, language shapes how we think. But my favorite is this example above. Only a linguist — or perhaps a social scientist — would put Chomsky in a hypothetical. Sure, we often hear from the prominent, popular scientists of today: Steven Pinker, Richard Dawkins, E. O. Wilson. But what about the next generation? Who are they, and what are they thinking about? The answers can be found in the engrossing essay collection What’s Next? Dispatches on the Future of Science, which offers a youthful spin on some of the most pressing scientific issues of today—and tomorrow. Take, for example, Laurence C. Smith's essay on global warming. Instead of rehashing the debate, Smith wonders about the possibility of people migrating to the Northern Rim as temperatures rise and inhospitable environments become more livable. Associate professor of physics Stephon H. S. Alexander tackles dark energy; other pieces address memory, morality, why viruses matter and the inevitability of human extinction. Kinda scary? Yes! Super smart and interesting? Definitely.